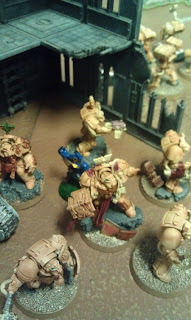 It's the end of my impromptu tournament season, so it's time to reflect on the aspect of hobby gaming that I've ignored most over the years: competitive play. I've been to a handful of 40k tournaments since 2010, with mixed results in terms of final rankings. One thing that's been consistent, though, is my internal monologue after the games are over, win or lose. It's not that I don't enjoy tournaments - what's not to like about spending 10 to 12 hours in an unventilated, sunless room playing games against strangers who more likely than not take things a little more seriously than you'd like? I can appreciate the lesson that competitive play teaches, since it's a lot like life - it seems like a lot of fun at first, but by the end, you're ready for it to be over. Last April, Jon and I teamed up for my first doubles tournament, and even though I complained about it at the time, it was my favorite competitive play experience to date. Two weeks ago, Colin and I met up to play another doubles tournament (and my first competitive games of 6th edition). I had agreed to play even though I wasn't really feeling up to it, but I decided not to drop out because I didn't want to let my opponent down. In an amusing but lucky turn of events, my first partner dropped out that morning, and Colin stepped in as a last-minute substitution. That was the first win of the day, from my perspective, as Colin is one of my top gaming buddies. As much as I wasn't expecting to see Colin show up, that wasn't the biggest surprise of the day: we started winning games. After a particularly hard-fought second match, it was clear we were in the running for prizes, which is a position I wasn't really expecting to be in. Yesterday, Valerie and I placed in a 2-Headed Giant Magic: the Gathering event and I took home even more loot. 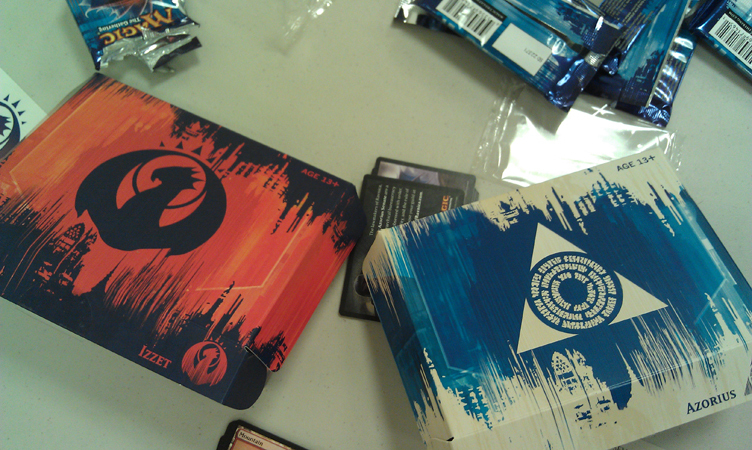 Izzet safe to be doing this? There's something soulless, to paraphrase my friend Matt, about playing games to get more stuff to play games with. But the novelty of free stuff is not yet lost on me, so screw that. The point I'm trying to make, though, is not about how sweet it is to win stuff. You can win stuff without doubling up, and you don't even have to share. The point is that doubles tournaments are their own reward for a few key reasons. Doubles tournaments are a guaranteed win. With the right partner, even if nothing goes right, your entry fee has already guaranteed that you're going to be spending a solid afternoon hanging out with someone you enjoy. The entry fee for the tournaments I attend is about the price of a movie ticket, and during that time I can actually talk to my partner without getting shushed. I don't really have a lot of memories about individual games I play, but I almost always remember the times I've teamed up with someone. The last-round beer run that Jon and I made before we got completely annihilated in April's event was hands down my favorite 40k moment. Doubles tournaments bring a new dimension to the game. Beyond simply managing your own resources, in a doubles game there's the meta-challenge of making it all come together. Games are about making choices, and teamwork is a game within a game. Doubles tournaments made me a better player. Pair up with someone a little smarter than you, follow their lead, and keep your eyes open for tactical opportunities. Your partner is bound to suggest novel approaches that would not have otherwise occurred to you. That's good, because it might win you the game, but it's even better if you learn what your partner is doing, understand it, and apply it to your future games.